One of many paintings of Aboriginal people arising from Russell Drysdale's extended journeys throughout northern and western Australia, 'Shopping day' ranks among his most powerfully emotive portrayals of the human condition, and reveals his emphatically humanist approach to his subject. 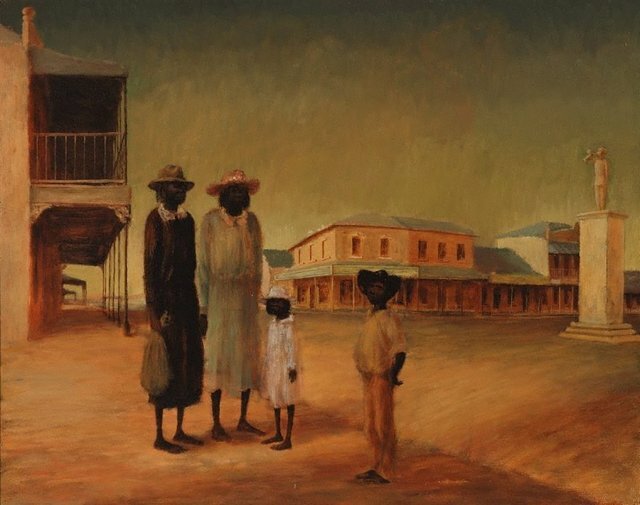 Drysdale's portrayal is based on his memories of Aboriginal groups he had observed coming into the country towns of far north Queensland, from outlying settlement camps. It conveys, with great sensitivity and eloquence, the dispossession of Indigenous people during the early 1950s when they were obliged to integrate into white society. Signed l.r. corner, red oil "Russell Drysdale". Signed u.r. corner verso, red/brown oil "Russell Drysdale/ ...". Not dated.